We’re thrilled to be partnering with Partyology, a haute new party planning app and site to offer our Kleinfeld brides an amazing prize valued at $1000! Whether you’re just engaged or well into the wedding planning process, you’ve likely realized that there’s much more to plan than just the wedding day. There are countless parties from the engagement party, to the morning-after brunch, and everything in-between. Kleinfeld can be with you through it all, helping you throw a stylish bash with picture-perfect details, thanks to our friends at Partyology. Partyology curates gorgeous ideas, decor, and (best yet! 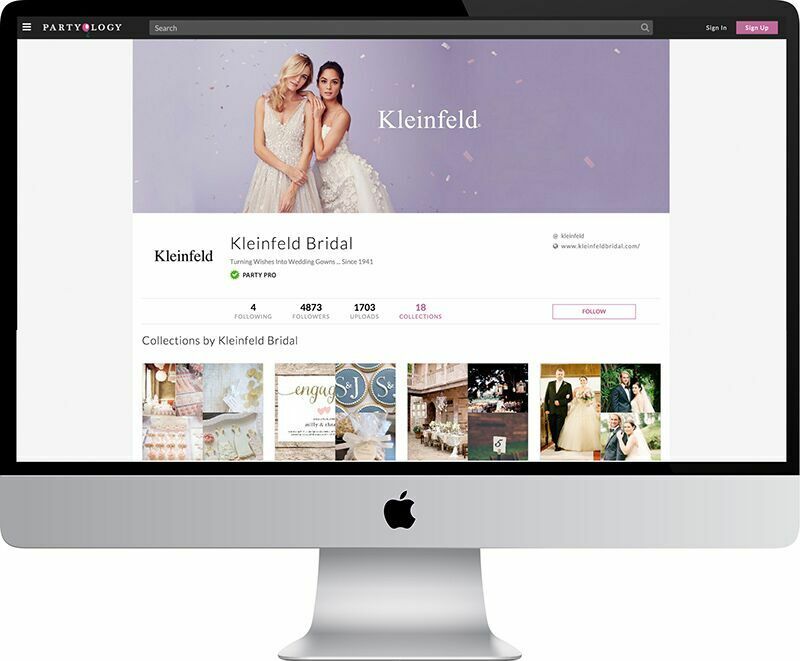 ), shoppable details from around the web to plan all your wedding-related events well beyond an inspiration board, and into truly attainable party ideas you can purchase, plan, share and execute… All at your fingertips via their uber-chic app or easy to use site. We love the concept so much, Kleinfeld is now Partyology’s exclusive wedding style Tastemaker – helping our brides and fans add a touch of Kleinfeld style to any event they are planning. 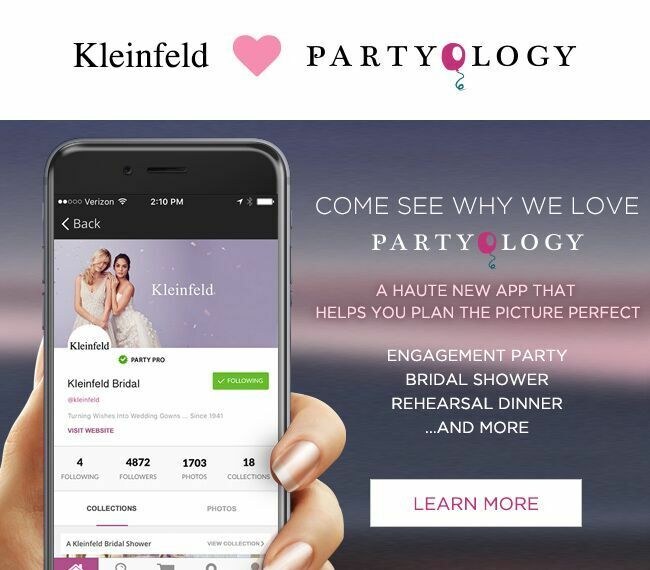 Once you sign up to Partyology, you’ll have instant access to amazing ideas curated by our expert Kleinfeld team. But of course there’s more… Here’s how you can WIN over $1000 worth of prizes to help plan your wedding, compliments of Kleinfeld and Partyology. 2. Check out the Kleinfeld collections to be inspired by wedding-related party ideas that take our breath away. 3. Create your own dream party on Partyology using 3 ideas from Kleinfeld and any number of the thousands of beautiful images found on Partyology. 4. Now to win the $1000 in prizes you need to share your dream party ideas with us. Comment below with your Parytology collection URL! 5. Kleinfeld Bridal will vote on the most creative party concept and Partyology will announce the winning collection! The winner will receive a $500 gift certificate toward a Kleinfeld gown** AND $500 toward the Partyology shoppables for their party! That’s $1000 of fashion and style goodies toward the wedding and party experience of your dreams. 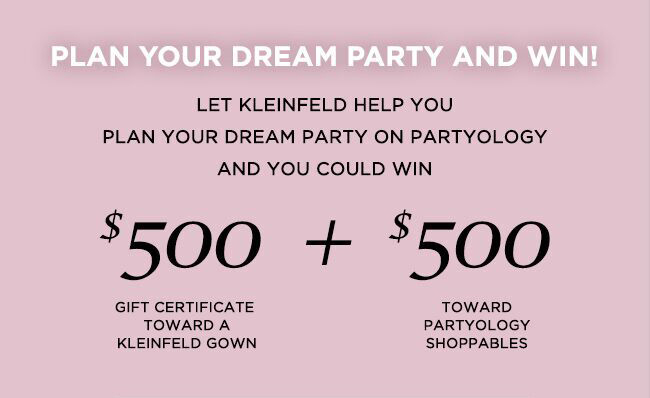 Contest begins on February 22nd and comments will close on March 3rd, so create your Partyology account now and let Kleinfeld inspire and gift you with a truly amazing prize! **$500 Kleinfeld Gift Certificate towards a special-order bridal gown valued at $2500 and up; Offer valid thru January 31, 2017; Offer valid in-store only; Offer not valid on off the rack sample sale gowns; Kleinfeld operates by appointment only.